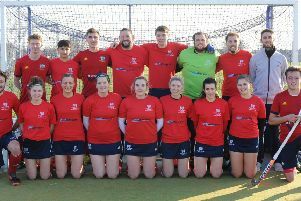 City of Peterborough 1sts in National League action (red). City of Peterborough men face a brutal return to competitive action this weekend. City, whose last National East Conference fixture was on November 25, travel to Brighton tomorrow (February 2) before hosting crack National Premier Division side Beeston in a National KO Cup match at Bretton Gate on Sunday (2pm start). Action from City of Peterborough Ladies 1sts (red) v Harleston last weekend. Photo: David Lowndes. City have been occupying themselves with friendlies, but manager Graham Finding is wary of this weekend. “Brighton will be smarting from the reverse fixture,” Finding said. “We picked up a 3-2 win, one of our best results of the season, but they have finished in the top three in each of the last three seasons so it will be tough for us to beat them again. “Only when that game is over can we think about Beeston. We will seek to be competitive and get the most from the game, but the Premier Division resumes a week after the East Conference so they may send their full first team. City are currently eighth in the East Conference six points and three places behind Brighton. City seconds have hit some strong form. 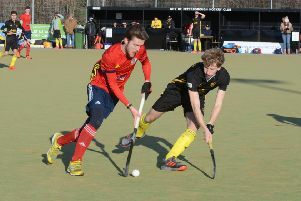 They moved up to fifth in the East Premier B Division with a 7-1 duffing of Shefford & Sandy last weekend. Paul Hillsdon, Connor Allen and Will Astbury all scored twice. Bourne Deeping firsts are going even better in third spot. They leapfrogged Dereham after beating them 2-1 with goals from Simon Miles and Andrew Williams. That’s now five wins in a row for the Lincs club. And Spalding firsts won away from home for the first time this season as Steve Rogers scored four in a 6-4 success at West Herts. Young players excelled in the lower City of Peterborough sides. Oscar Revell (15) scored his first goal for the sixths in a 7-2 defeat at Spalding thirds, while teenager Angus Macbeth scored on his debut for the sevenths in a 2-2 draw with Cambridge Nomads. Ben Scholes scored four for Spalding thirds. And youngster Helene Wilson netted as City of Peterborough Ladies thirds won 2-1 at Spalding seconds in East Division Three North West. City Ladies first were disappointed to lose 1-0 at home to Harleston seconds in the Premier Division. They have slipped into the bottom half of the table ahead of tomorrow’s game at St Albans seconds. City seconds are set fair for promotion to Division One though. They are 10 points clear at the top of Division Two North West after a 3-0 victory over Long Sutton at Bretton Gate. Jess Broadway, Hope Elkins and Isobel Hughes scored the goals.